It has no buttons (except for volume and camera). 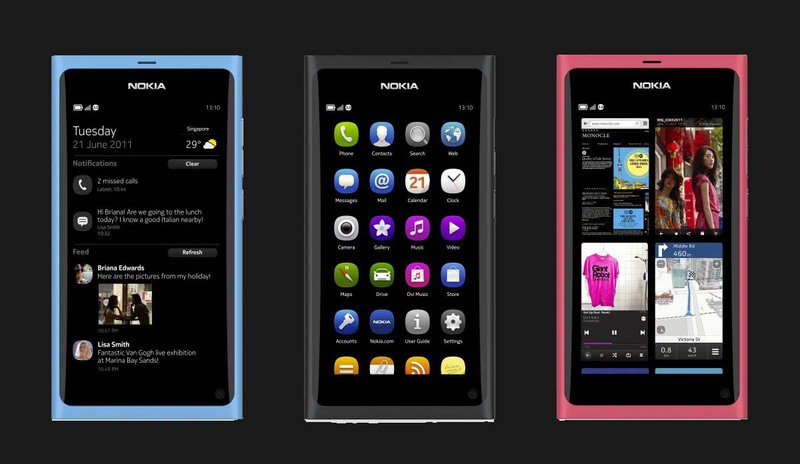 Rather than use a single ‘home’ key or a set of buttons like Google’s Android does, the N9 (which runs MeeGo, not Symbian) accomplishes navigation using swipe gestures. To complement the monobloc design, the N9 has a 3.9-inch AMOLED display — the display is placed right under the capacitive glass layer, which makes the touchscreen ‘float’ on the surface. ☻GPS, Wi-Fi and NFC — all in a polycarbonate shell that weighs 135 grams and comes in three colours. ☻ Comes bundled with few apps – PDF viewer,Ovi maps, Angry Birds Magic, Document Editor, Facebook and Twitter. It has no buttons, all the functions are performed by swyping or tapping. You get 3 home screens(don’t know if we can add more). First screen is for the notifications and events including feeds from social networks, missed calls and received calls etc. Second is the application screen or the menu screen which all the apps installed. Third and the most appealing one, shows all the apps running in background. What so attractive about it is that it shows the small version of the app which means apps is not only visible but working too(live apps). When using any app, you can swype from any of the four directions to get back to your home screen and the app automatically gets tossed up in the ‘multitasking view’. It has multi-touch support so you can pinch to zoom on maps,browser,images etc, even the multi-touch feature works on the ‘multitasking view’. It is NFC enabled, you just have to do Bluetooth pairing only once and after that you can connect to nfc enabled accessories just by touching. You can also share content like photos or business cards via NFC. 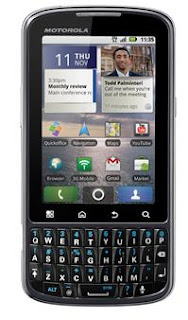 Slated for an international launch next month, the Motorola Pro is a candybar phone running Android 2.2. ☻a physical four row QWERTY keypad below the display. ☻3G, Wi-Fi with hotspot, DLNA, Bluetooth and GPS connectivity. ☻5MP AF camera with dual LED flash on the rear that records videos in 480p (704 x 480 pixel). ☻expected to be priced at $570. 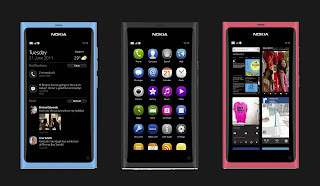 It’s great news for developers… The Nokia N9 Smartphone, based on MeeGo 1.2 Harmattan, is an exciting addition to the range of Qt-powered phones from Nokia. The new Linux-based platform, called MeeGo, looks fantastic. It's fluid, smooth, and the "swipe" idea looks really interesting.